General Peter Pace at his birthday. In the November issue, WL incorrectly identified Nichelle, Frank and Barbara Ann Robinson as Mary Alice Haney and Mae Haney Grennan and General Manager Jim Bowden was incorrectly identified as a coach at the Nationals’ Diamond Gala. 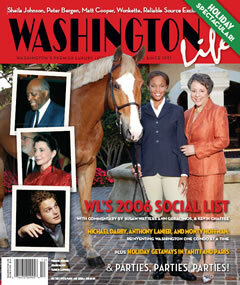 In addition, WL Fashion Editor Barbara McConaghy was inadvertently left off as stylist for the “Horse Country Fashion Shoot.” WL regrets the errors.